There’s a new way to explore Bermuda in 2018, as Andrew Forbes discovers. Travel can be a fickle affair; we full in and out of love with destinations, sometimes ignoring our faithful favourites, allowing ourselves to be seduced by somewhere new. Yet Bermuda is one of those extraordinary destinations that has stood the test of time; it’s always in vogue. It is Bermuda’s rare and compelling island allure; an unspoilt environment, full of quaint old-world charm, combined with contemporary, world-class hotels and restaurants, that keeps visitors coming back. 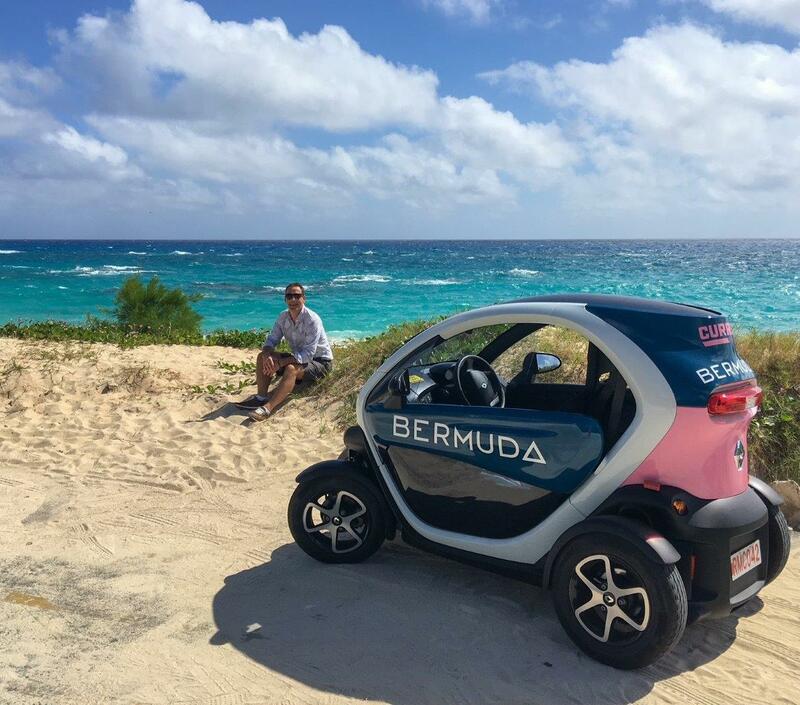 Yet Bermuda isn’t an island that stands still – and new for 2018 are the twin-seater electric Twizy cars, which offer a truly memorable, fun and exhilarating way to explore or re-discover Bermuda like never before. Previous visitors to Bermuda will remember that renting a car isn’t an option for non-residents. Instead vacationers typically hire mopeds and bikes to navigate the island’s lanes and highways. 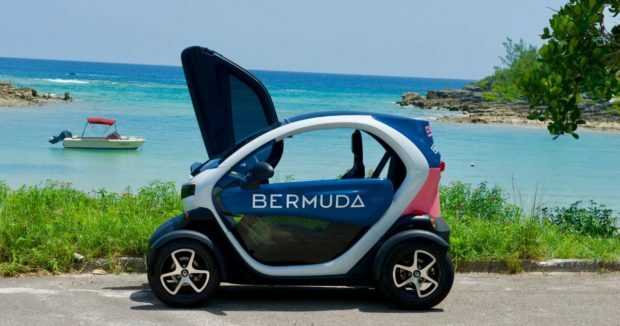 Yet now, thanks to the aptly named Current Vehicles Bermuda, (based in the Hamilton, the capital) there’s a cool and eco-friendly way to get around – the Twizy. 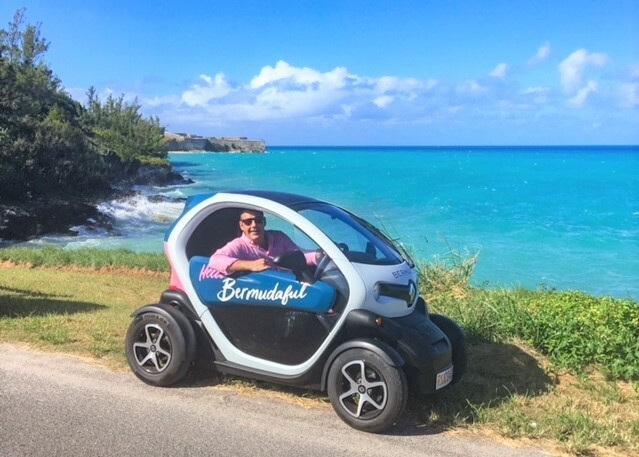 As a travel writer I sometimes dwell on the old cliché that the journey can be as important as the destination; well when driving a Twizy on Bermuda that’s most definitely the case! Bermuda is a British Overseas Territory, and most of the island’s roads follow the same routes established by the early settlers. That’s certainly part of Bermuda’s charm, but it also means that many of the roads are narrow and windy. Yet when driving a Twizy, these lanes become a real pleasure. These super responsive vehicles command the road like a car, yet occupy less space, so you really feel comfortable navigating the island. What’s more a Twizy electric car is perfect for those that aren’t confident with a moped – after all 4 wheels are easier than two. The Twizy is so-called as it’s a twin seater that’s easy to drive. You just turn the key to switch on the motor, release the parking brake and press the accelerator and you’re off! No gears, no hassle. The twin seats are inline, providing deceptive amounts of space – I am 1.85m tall, and I was both comfortable driving up front, as well as being a passenger in the back. There are seatbelts, side-impact protection and airbags – they’ve thought of everything. Each Twizy has Bluetooth and USB connected to the sound system, so remember to put together your island playlist before you leave for your holiday – so you can enjoy your favourite tunes as you whizz around the island. If you look at a map, you’ll see that Bermuda is shaped like a fish hook; and although one might think of Bermuda as one island, the truth is that the territory is made up of more than 120 islands! The principle islands are connected thanks to road bridges and a causeway; so, for the adventurous Twizy explorer that means there’s a whole lot of island and coast to enjoy. 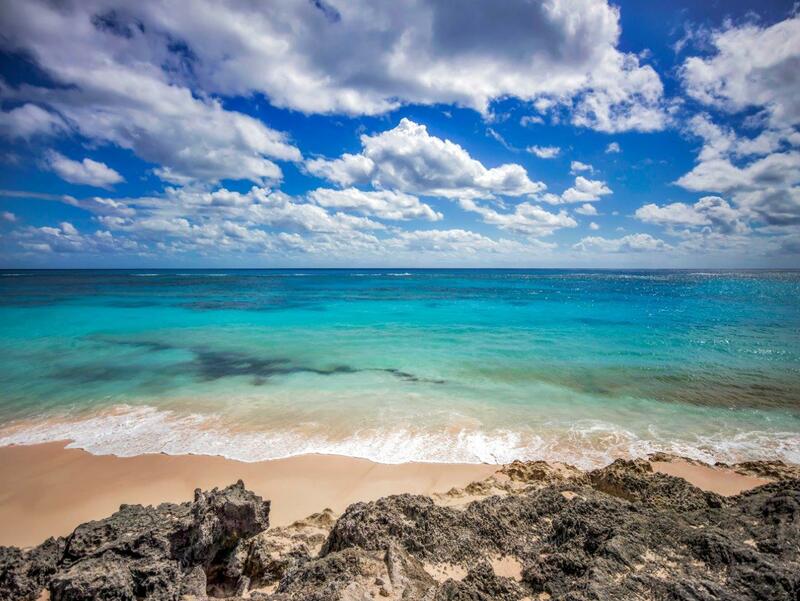 Bermuda’s brilliant Atlantic light means that its clear cerulean waters shimmer and sparkle. With my Twizy I was able to get right down to the beaches, and I never had a problem finding a parking space. There’s space beside the seats for your beach towels, and in addition there is a small lockable compartment for valuables. 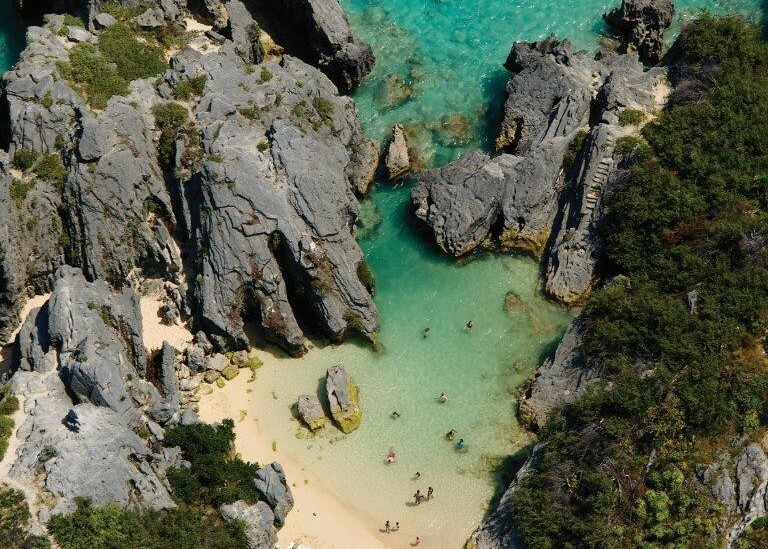 So, throw on your swimmies and head to the coral coloured sands of beautiful Bermuda. The magic of Jobson’s Cove is worth searching out – it’s a secluded, natural swimming pool of emerald waters, where you can swim with colourful fish. 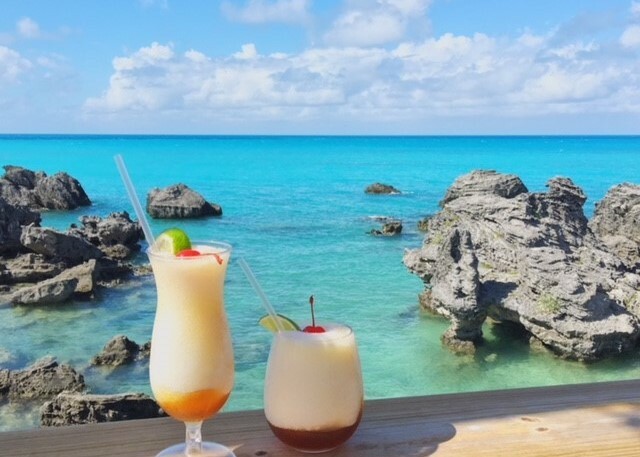 For a young at heart, relaxed island vibe we headed to Tobacco Bay – and what better way to kick back, and slow to Bermuda island pace then enjoy a refreshing frozen Dark ‘n Stormy cocktail made with a just a dash of Bermuda’s famous Gosling dark rum. Take a seat on the deck, order some fried fish, enjoy the beats of the bar’s soundtrack, and get dizzy enjoying that knock-out view – it’s an area of outstanding natural beauty. 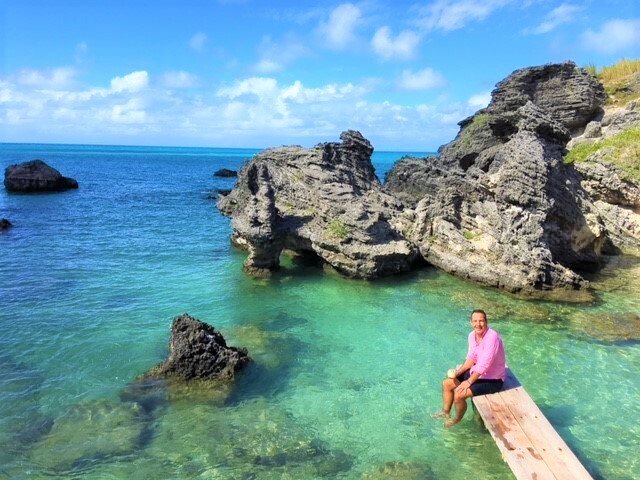 For a captivating dose of island culture and history I couldn’t resist the temptation to explore the Town of St. George; the former capital of Bermuda. It’s one of the oldest British settlements in the Americas and is now a UNESCO recognised world heritage site for its old town architecture. Here one finds one of the many charge points for your Twizy. 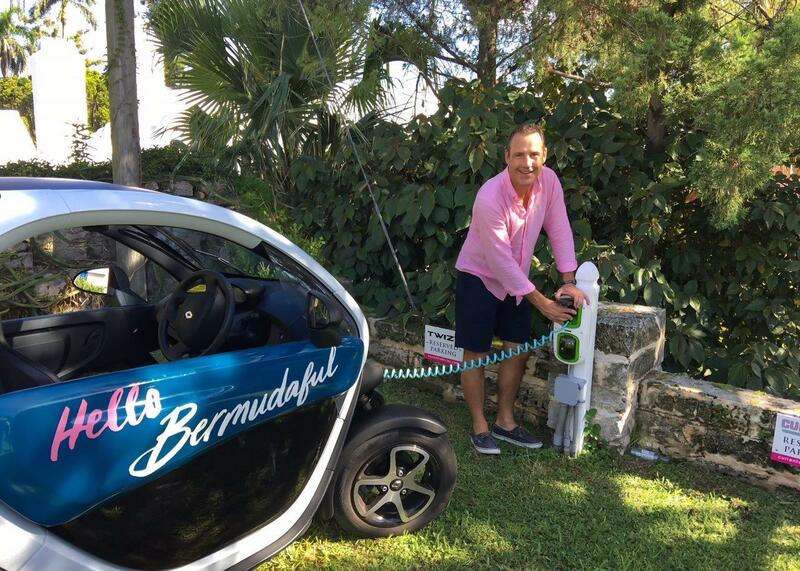 In my experience a full charge (good for about 50 plus miles) was enough for a day’s travel, since Bermuda is little more than 20 miles or so end to end. However, if you like to hit the accelerator a little, then take advantage of a top up whilst you go explore on foot. Recharging is included in the rental from Current Vehicles – you just open the front of the car, pull out the cable and plug in the car – it’s as simple as that. 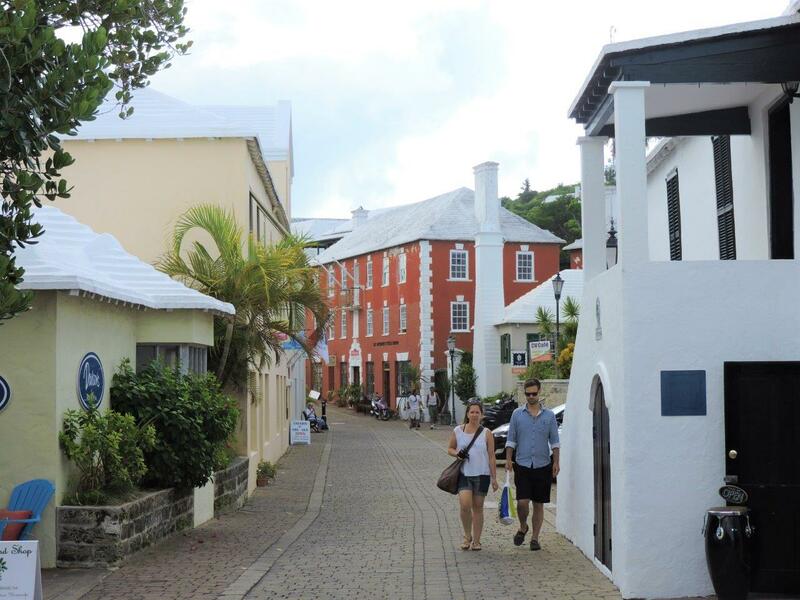 St. George’s has been meticulously preserved, and its narrow streets and alleyways holds many secrets of the island’s past. Take a self-guided walking tour and you’re sure to have a unique experience, and enjoy the many charming old houses. 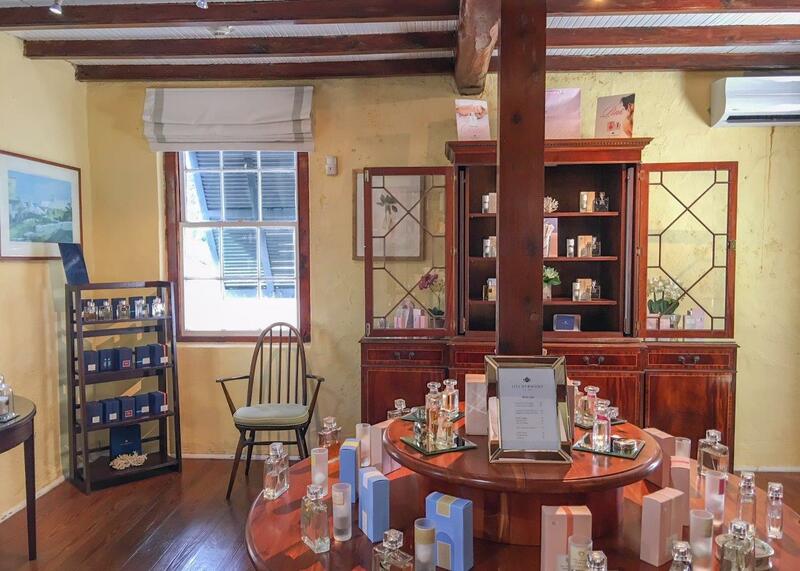 The Bermuda Perfumery, home to Lili Bermuda is a popular destination – undeniably touristy, but don’t miss it. Here this artisanal perfumery promises to share the scents of Bermuda…’of the wind and fresh salt spray of the ocean, to luscious botanicals such as Bermuda cedarwood, spring freesias and juicy loquats’. I was captivated by the intriguing story of the Mary Celestia perfume, which has been recreated from a 19th century perfume recovered from the Bermuda shipwreck of the Mary Celeste. Of course, when in Bermuda you’re never far from a tale of shipwrecks, pirates or the infamous Bermuda Triangle, yet this true story is truly fascinating. The Mary Celeste was breaking the blockade of the US Civil War in 1864 when it was hit by a Tempest-style storm and sank. Despite a manifest stating simple food, uniforms and munitions, the ship was in fact also carrying luxury items from Europe (tucked away within the bow of the ship, out of sight from the main cargo), including wine; and, fine perfume from Piesse and Lubin London – a perfumery on Bond Street. Fast forward some 150 years and divers have recovered items from the wreck. Although the wine retrieved from the seabed was spoiled, the seal on a perfume bottle was intact. 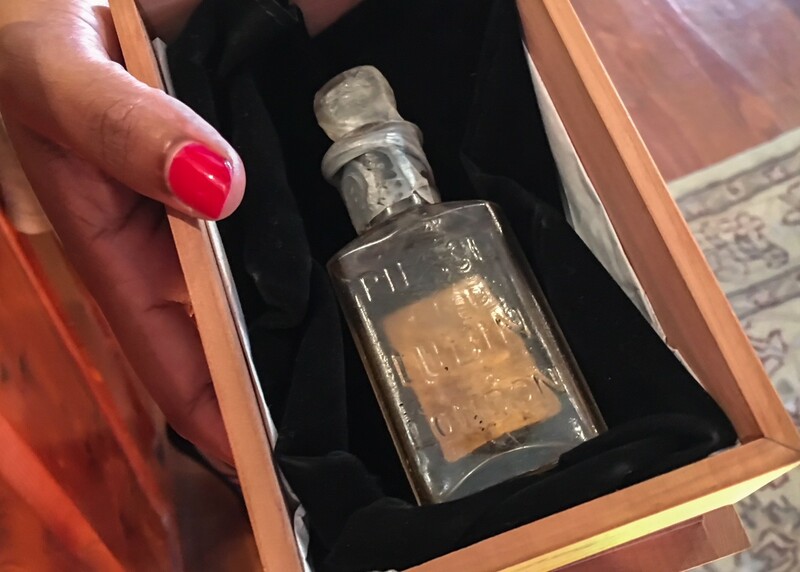 The perfume bottle was taken to the Bermuda Perfumery, and shared with the owner Isabelle Ramsay-Brackstone, who is the head perfumer of ‘Lili Bermuda’. With the help of contemporary scientific equipment from ‘drom fragrances’ in the US, it was possible to establish the ingredients of this fresh and citrus scent. Although some elements are no longer available, the scent has been recreated and you can experience it at The Bermuda Perfumery, where a bottle of the scent is kept in a Bermuda cedar box. In fact you can take home a a little piece of Bermuda history, as the eau de perfume is available for men and women in a classic square glass bottle elegantly decorated with a blue ribbon and a silver medal depicting the shipwreck. Temping as it is to stay on the beach, Bermuda has loads more to offer. Catering to the desires of the increasingly active visitors to the island, there is a diverse choice of water sports and adventure activities to enjoy. 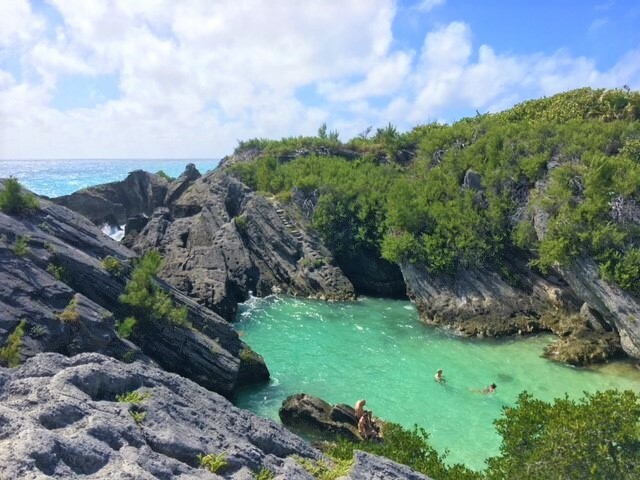 You can read about my Bermuda Bucket List activity here. Afterwards you can reward yourself for your exertions with a great beachside lunch. 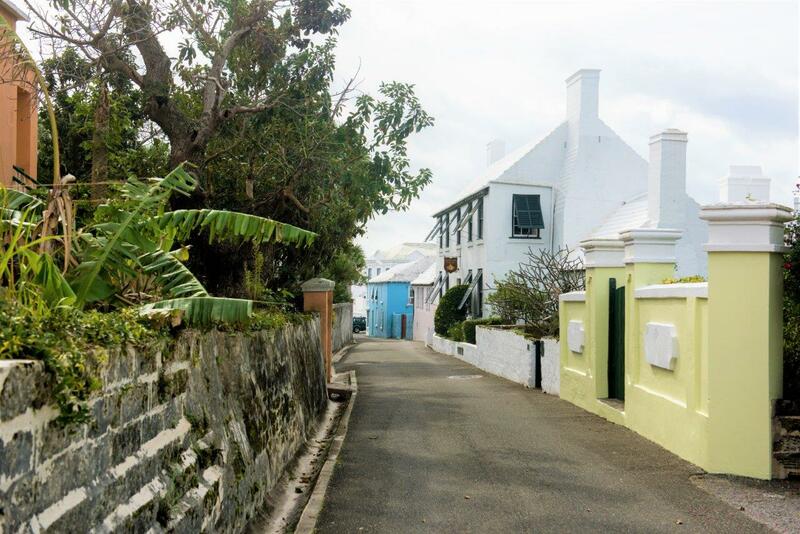 Heading to the south-western edge of the island, passing through many of Bermuda’s nine parishes, past clusters of the island’s iconic pastel-coloured homes with pristine white terraced roofs, I arrived at Somerset Village. 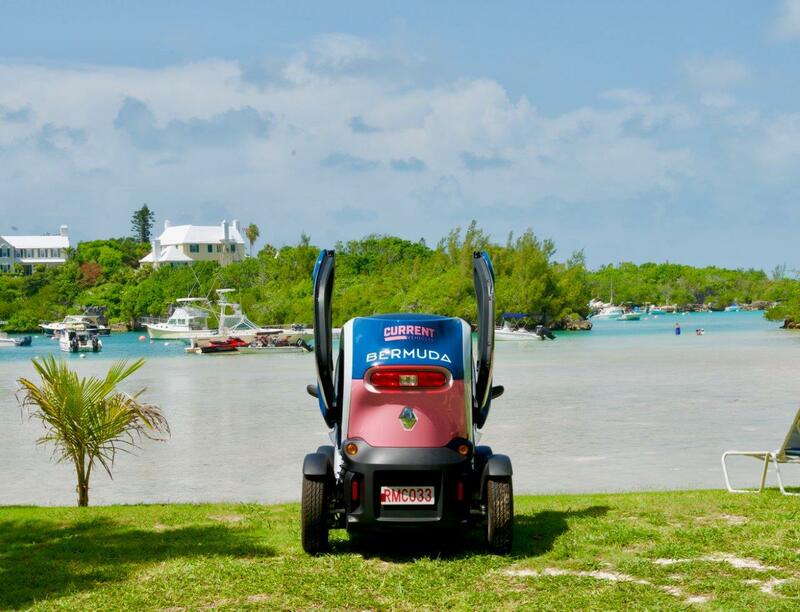 Here we parked up our Twizy cars by the postcard-perfect Long Bay Beach and took a break at the al fresco Breezes Restaurant. It felt so good to take a refreshing dip before lunch of a fresh fish wrap. 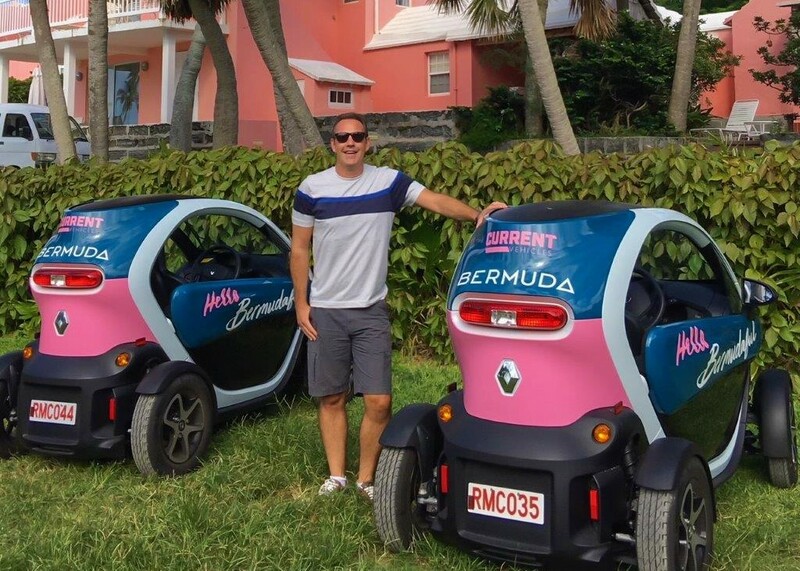 We typically head to Bermuda to recharge on a classic beach vacation – yet now that experience an be a whole lot more adventurous, thanks to the new Twizy eco-friendly rental cars, which open the island to visitors like never. For further inspiration for Bermuda travel planning, check out the island’s official travel & tourism website Go To Bermuda.